Inquiry is the Institute’s global issues program for high school students, creating a forum for students to engage deeply with compelling issues through intensive study, role-play, and mentorship by Tufts EPIIC students studying the topic in-depth. It culminates in a role-playing simulation, bringing students from Atlanta, Chicago, Indianapolis, New York City and the greater Boston area together. The Inquiry simulation aims to enhance students’ understanding of global citizenship and to develop their leadership skills by emphasizing a collaborative approach to complex problems. In the past 20 years, more than 4,800 high school students and 750 Tufts students have participated in the program. This year’s inquiry simulation – on the future of Syria – was full of robust debate, conflicting ideas of the road to peace, detailed resolutions and informed discussions. Happening in the midst of the Syrian Government’s use of chemical weapons on its own population, and the US targeted missile attach in response, gave added weight to the proceedings. 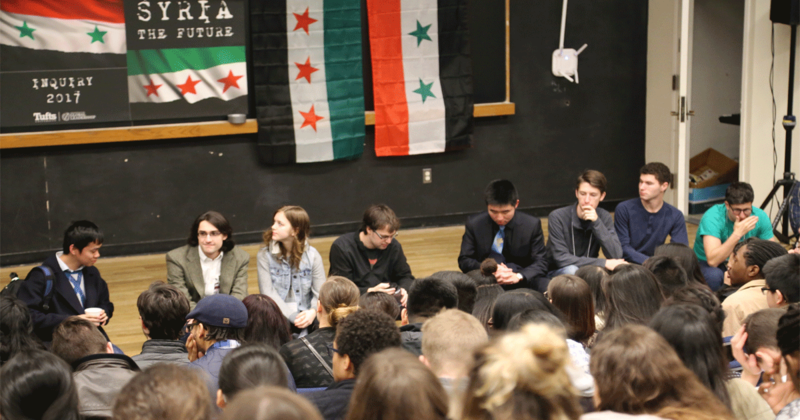 The program brought together the many different actors engaged in the ongoing civil conflict within Syria – both internal and external actors – and allowed students to begin discussions about what a post-conflict Syria could be. High school delegates were presented with tough questions including: how did a non-violent protest by students evolve into a multi-faceted, horribly violent and destructive civil war that has affected not only Syria’s neighbors but extended far beyond its borders? And how might it end? Before beginning their deliberations, the students were introduced to some of the topics by experts in the field. Inquiry 2017 began with a panel on resettling Syrian Refugees in the greater Boston area. Marc Jacobs, chief executive officer of Jewish Family Service of Metrowest; Lucia Carballo Panichella, the project leader for the Jewish Family Service's Syrian Refugee Humanitarian Project; and Jenna Russell, a reporter at the Boston Globe, made a compelling panel that spoke about local efforts to help resettle Syrian refugee families. Many of the speakers noted that it is important to include refugees in existing communities rather than being isolated in the outskirts of the city. An excerpt from a new documentary, Cries from Syria, was also shown, detailing the flight out of Syria for the more than 500,000 refugees. Student delegations had the opportunity to ask questions of the panelists before meeting in small groups to discuss what they had seen and heard. The goal of the first night was to remind the students of the human cost and consequences of the civil conflict, now entering its seventh year. Faysal Itani, Resident Senior Fellow at the Rafik Hariri Center for the Middle East at the Atlantic Council, gave this year’s Hunter Farnham Inquiry Memorial Lecture on “Syria’s Multidimensional War and Future” on the second day of the program. Itani has briefed the United States government and its allies on the conflict in Syria and its effects on their interests and he is part of the Atlantic Council’s two-year initiative on Rebuilding Syria. He discussed the Syrian conflict with Inquiry students and pushed them to question such issues as ehat are the regional implications as Saudi Arabia and Iran eye their spheres of influence in the Middle East? The students asked a broad range of questions following the talk. The keynote address led into the opening statements for the student delegations. The 24 participating delegations ranged from the Syrian Government and Syrian National Coalition to the Kurdish Democratic Union Party (PDY) and Hezbollah to the United States, Iran, Russia and humanitarian NGOs. Their opening statements laid out a broad range of possibilities including the establishment of safe and no-fly zones, the potential of Russian withdrawal, and the need to contend with human rights violations. Following the opening statements, the delegations began their real work – to address Syria’s future, broken down into seven committees: Governance; Strategic Security; Local Security; Social Reconstruction; Economic Reconstruction; Justice, Peace and Reconciliation; and Cross-Border issues. Committees met throughout the rest of the simulation to address difficult challenges, from what an interim government might look like to contending with the plethora of foreign militaries, militias and fighters within the country’s borders, from avenues to justice and reconciliation to the physical task of rebuilding the country. The Strategic Security committee voted and passed a national ceasefire, which he Syrian Government later backed out of, and delegates tried to strike a deal with other key players to solve any conflict of interests. The Governance committee submitted a proposal pushing for the interim government to be comprised of people from each faction/district of Syria to ensure equal representation with an ultimate goal of a democratic government with fair elections and a distribution of power on a local and national level. It also agreed to a constitutional clause allowing for Kurdish secession after two elections cycles or if the government collapses. The Justice, Peace, and Reconciliation committee battled with the tensions between justice and stability in conflict resolution. After days of frustrating debate, the committee also voted to try Bashar Al-Assad in an international war crimes tribunal. The Social Reconstruction committee voted unanimously for NGOs to be allowed access to post-war Syria to aid in social reconstruction and passed a resolution on human rights noting that all religions should be free to practice in Syria. The Cross-Border Issues committee deliberated on various proposals calling to lead an international coalition of states against ISIS and other prominent terrorist groups in Syria. It also came up with a plan for repatriation of Syrian refugees from Jordan, Lebanon, Germany, Turkey, and Egypt. Humanitarian NGOs and the Moscow Group lobbied hard and eventually developed annual quotas for refugees to be resettled under the supervision of the Humanitarian Council. After much debate, the Economic Reconstruction committee passed two proposals relating to the distribution of water in Syria. The Local Security committee passed a resolution aimed at removing ISIS leverage over the civilians of Syria in conjunction with a plan to attack ISIS’s oil refineries and other natural resources. The conference concluded with closing statements from all delegations about their experiences. The delegations shared their long term goals, their hopes for peace in the region, and their detailed proposals to address the conflict. As the Syrian Civil War reaches looks at its seventh year, the global community faces a dire situation. An estimated 500,000 Syrians have lost their lives and approximately 11 million have been displaced. Facing a civil war turned global crisis, the students faced the challenge of an enormously complex conflict to think about possible solutions.